As a result of recent increased demands on capacity in the College Green area, Dublin commuters are experiencing delays in the city centre area during certain peak periods. Arising from those consultations, a number of changes to Dublin Bus routes will be implemented in the College Green/College Street area. These changes will reduce the number of buses passing through these streets and allow for a more effective operation of services in the area. From Monday 29 January, a number of Dublin Bus routes which currently travel through College Street and Westmoreland Street will, instead, be rerouted via Tara Street and Burgh Quay. This change will apply to the northbound/westbound directions of the following routes: 25, 25a, 25b, 25d, 37, 39, 39a and 70. None of the bus stop locations on these routes will change and bus passengers will be unaffected. In addition, the following Xpresso services will be re-routed away from College Green, requiring some bus stop changes: 25x, 27x, 32x, 33x, 39x, 41x, 51x, 66x, 67x. Some of these services will be routed away from D’Olier Street, College Street and College Green through Hawkins Street, Townsend Street and Westland Row. The combined impact of these changes will enable the traffic signalling system and junctions in the College Green area to operate more effectively. The National Transport Authority will continue to work with Dublin Bus and Dublin City Council to monitor the impact of these adjustments. Should a further reduction of vehicles travelling through this area become necessary, a number of other measures will be considered for implementation. Those additional measures would include some further bus route changes in addition to potential taxi restrictions. However, these will only be considered in the event that further vehicle reductions are required. 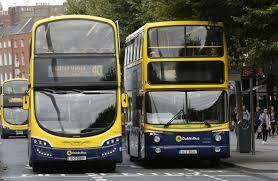 Full details of all these changes are available on www.dublinbus.ie, and at affected bus stops.